Gorgeously Renovated Two-Story Brick Home In Sought-After Rolling Fields, one of the most beautiful neighborhoods in Louisville! Formal entry leads to the large, light-filled living room with gas fireplace and built-in bookshelves. Chef's kitchen designed by locally owned Burkhart Company, Kentucky's premier cabinetry maker. It features an eight foot island with incredible granite, new GE dishwasher and a large stainless sink. New stainless appliances including a 36''Bertazzoni range, an amazing amount of custom cabinetry plus counter space and a fabulous glass tile back splash. Kitchen opens to gorgeous dining space & along w/ access to large deck overlooking the backyard. Large family room is surrounded by floor-to-ceiling windows and offers a wet bar andexposed brick accents. The first floor also features a nice-sized office (potential 4th bedroom) and a renovated half bathroom with designer wallpaper and wainscoting. Beauitful master suite features custom built-ins, ample closet space, and a fantastic master bath with soaking tub, a marble-topped vanity with two sinks, and a walk-in shower with a custom glass door. The upstairs has two more bedrooms, each with large walk-in closets. A charming, second full bathroom completes this floor. The basement is partially finished with another family room or potential bedroom (non-conforming egress window), a large laundry and workout area, and an unfinished storage area. Additional updates includes electric panel, vent-free fireplace logs and landscaping. The backyard has space to play, a large paved area for basketball and the fantastic deck with eating and outdoor living/entertaining area. An attached lower level two car garage completes the property.This is an amazing opportunity to buy a turn-key home that has been lovingly restored to today's standards of excellence and design. 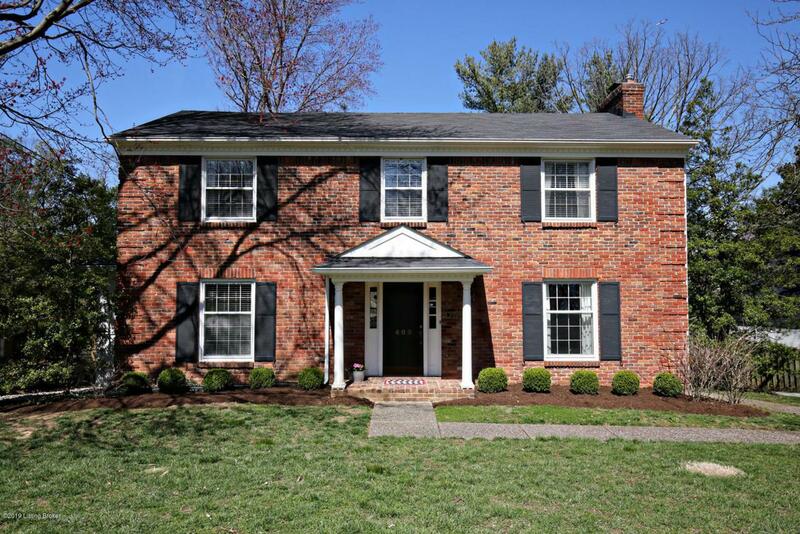 Listing provided courtesy of Louisville Gaines Real Estate. © 2019 Metro Search, Inc. All rights reserved.